Mash honey and fresh basil together (using a fork or a mortar and pestle) until a paste is formed. 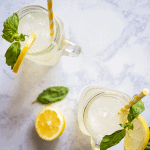 In a large container or pitcher, combine the basil/honey mixture, lemon juice, and cold water. Cover and store in the fridge for a couple hours or overnight – note that the longer it sets, the more basil flavor there will be when served. Strain the lemonade mixture through a fine mesh sieve to remove any solids (and the mushy basil). To serve, put 1 cup of ice into each of 4 glasses. Pour lemonade over the ice (about 1 cup each) and garnish with a fresh sprig of basil, if desired.